In 1985, Arnie Gast left a six-figure salary behind and pioneered the custom closet business in St. Louis. Since day one, he has owned his own building, his own equipment, and has manufactured each and every closet and storage system right here in St. Louis. Soon, his son David joined the company, and learned the business from the ground up. By 1987, David had worked in the shop, as an installer, and personally designed hundreds of custom storage systems. David was ready to open his own store, and moved to Kansas City, where he did just that. Eleven years later, Arnie was ready to turn his attention towards his burgeoning closet accessory business, so David, his wife and three children moved back St. Louis, took over his father's custom closet business, and continued the operations until November of 2005. More than just a "closet company"
In November of 2005, after twenty years of improving St. Louis spaces, David saw that his family's business had grown into more than just a "closet company." His clients were now calling upon him to improve office, pantry, garage, entertainment, and numerous other storage spaces. 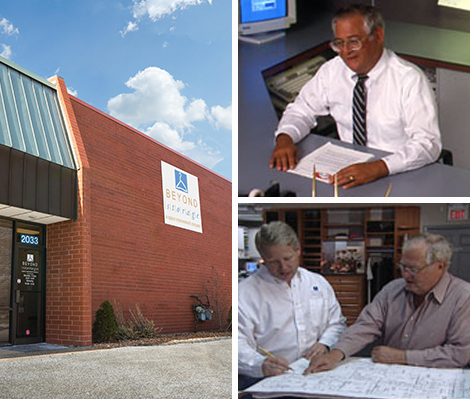 Therefore, to focus on the unique needs of his St. Louis clients, he renamed his business "Beyond Storage -a space improvement company" reflecting the expanded scope of his business. As a purely local business, Beyond Storage pays no royalties or franchise fees, so David can pass these savings along to his clients. We guarantee to beat ANY competitor's lowest price by 5% assuming like materials and design. Plus, unlike our competitors, we provide a blue print of the design for free.